Jeremy Corbyn has faced criticism from senior Labour colleagues for saying he would not fire Britain's nuclear weapons if he were prime minister. Shadow defence secretary Maria Eagle said the words were "not helpful", while shadow foreign secretary Hilary Benn said Mr Corbyn should abide by the party's decision on renewing Trident. Mr Corbyn said nuclear weapons "didn't do the USA much good on 9/11". He added that he was elected leader on a platform opposing Trident renewal. Prime Minister David Cameron said Mr Corbyn's comments showed Labour could not be trusted with Britain's national security. Following the shadow cabinet criticism of his comments, Mr Corbyn was asked by the BBC's John Pienaar what the point of the Labour defence policy debate and review was. He said: "The point of a policy debate is to try and bring people with me." In his conference address on Tuesday, Mr Corbyn said his landslide leadership win gave a "mandate" for his views on disarmament of Britain's nuclear weapons. On Wednesday's BBC Radio 4 Today programme he said: "I am opposed to the use of nuclear weapons. I am opposed to the holding of nuclear weapons. I want to see a nuclear-free world. I believe it is possible. "I do not think we should be renewing Trident... I think we should be promoting an international nuclear weapons convention which would lead to a nuclear-free world." It did not take a debate, within Labour or the House of Commons. A few words on the Today programme did the trick. Should he get to Number 10, he said simply, he would not press the nuclear button. Think of it this way: Corbyn declared to Britain's potential enemies that with him in charge they could disregard a multi-billion pound weapon system. Or, perhaps, put it like this: a man with a lifetime commitment to scrapping Britain's deterrent promised not to kill untold thousands of innocent people if he had the opportunity. Many politicians choose not to be so frank. Is there such a thing as a nuclear button? How important is Trident to the UK's security and international standing? Spending "£100bn" on replacing Trident was misguided, he said, arguing that the money could be spent on more "conventional" equipment and forces, and protecting "high-skilled jobs" of Trident workers. The Labour leader said 187 countries "don't feel the need to have a nuclear weapon to protect their security", and asked "why should those five need it themselves?". But it was his answer "no" to the question of whether he would ever press the nuclear button, which prompted some of his senior ministerial team to break ranks. Ms Eagle told the BBC "I'm surprised he answered the question in the way that he did", saying it "undermined to some degree" Labour's policy process. Labour's current policy was in favour of retaining a nuclear deterrent, she said, adding: "I don't think that a potential prime minister answering a question like that, in the way in which he did, is helpful." Mr Benn, Labour's shadow foreign secretary, said that while he wanted a nuclear-free world, "you have to negotiate them out of existence and not give them up independently". He told the BBC: "I think a British prime minister has to have that option and the whole purpose of the deterrent of course is it is trying to deter a potential enemy because they're not sure what you're going to do and that puts them off." Amongst others to question their leader's stance were shadow business secretary Angela Eagle and Lord Falconer. And Labour MP John Woodcock, who supported Liz Kendall in the Labour leadership contest, told the BBC Mr Corbyn's position would make the "grotesque horror of a nuclear holocaust" more likely. But Mr Corbyn's comments were endorsed by his shadow chancellor John McDonnell who told the BBC: "I don't believe the use of nuclear weapons is morally or legally appropriate, therefore we have to accept that." He said the Labour was "just saying what he means and I agree with that". In a later interview with BBC political editor Laura Kuenssberg, the Labour leader responded angrily to the suggestion he would put his principles before national security. "We are not under any threat from any nuclear power. We are not under threat from that. We are under threat from instability," he said. Mr Corbyn said he was aware of the different views in his shadow cabinet, but also pointed out his supporters "were prepared to vote for me knowing full well what my position was on nuclear arms". And he rejected the idea that the defence review was pointless given his position, saying "nuclear weapons are not the only issue in defence". Trident is the UK's sea-based nuclear weapons system - made up of submarines, missiles and warheads. 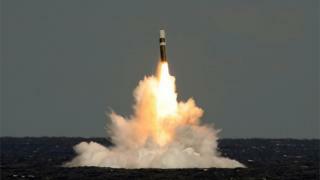 A decision on whether to renew Trident is due to be taken in 2016. Prime Minister David Cameron, speaking to reporters during a visit to Jamaica, said Britain's nuclear deterrent was "a vital insurance policy for our nation in what is a very dangerous world". "Frankly, the way the Labour leader has answered that question demonstrates that Labour can't be trusted with our national security which, after all, is the most important duty of government," he added. And Conservative Defence Secretary Michael Fallon said: "The Labour leader is effectively saying he would lower Britain's defences. "Deterrents don't work if you're not prepared to use them. Having nuclear weapons and our enemies knowing that we're prepared to use them in the most extreme circumstances of self-defence is vital to keeping our country safe." Paul Kenny, leader of the GMB union, said the existence of brutal regimes meant that any leader of the UK would have to be prepared "to think the unthinkable" about using Trident in exceptional circumstances. He told Channel 4 News that it "may be right" that Mr Corbyn couldn't be prime minister if his views didn't change. "If you're in that role and that's the position you're elected to - well maybe someone else should be given the button." Meanwhile, a close ally of Mr Corbyn's has accused an unnamed group of Labour MPs of "talking about" supporting air strikes in Syria merely to destabilise him. Speaking on BBC Radio 4, shadow international development secretary Diane Abbott said: "There's a group of Labour MPs talking big talk about voting with the Tories on bombing. Many are only doing it to disrupt Jeremy Corbyn's leadership." The British people, she added, would not "look kindly" on anyone who "put British troops in harm's way" because of internal Labour party manoeuvring.